Make an Arduino weather clock with time, date, and temperature. 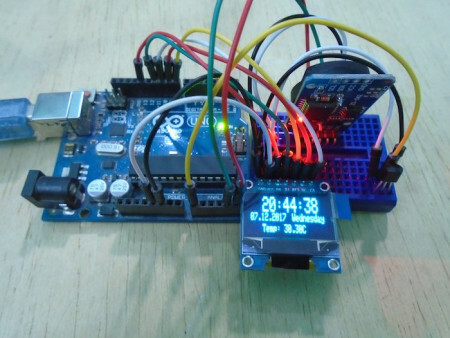 In this article, we are going to make Arduino weather clock which will tell us the time, date, and temperature. The LM35 sensor will give us the temperature, the DS3231 will tell us the date and the time, and we will use the OLED to display the temperature, date, and time. Connect CS of the OLED to pin 10 of the Arduino. Connect DC of the OLED to pin 9 of the Arduino. Connect RES of the OLED to pin 8 of the Arduino. Connect D1 of the OLED to pin 11 of the Arduino. Connect D0 of the OLED to pin 13 of the Arduino. Connect VCC of the OLED to 5V pin of the Arduino. Connect GND of the OLED to GND pin of the Arduino. Connect GND of the DS3231 to the GND pin of the Arduino. Connect VCC of the DS3231 to 5V pin of the Arduino. Connect SDA of the OLED to A4 on the Arduino. Connect SCL on the OLED to the A5 pin on the Arduino. 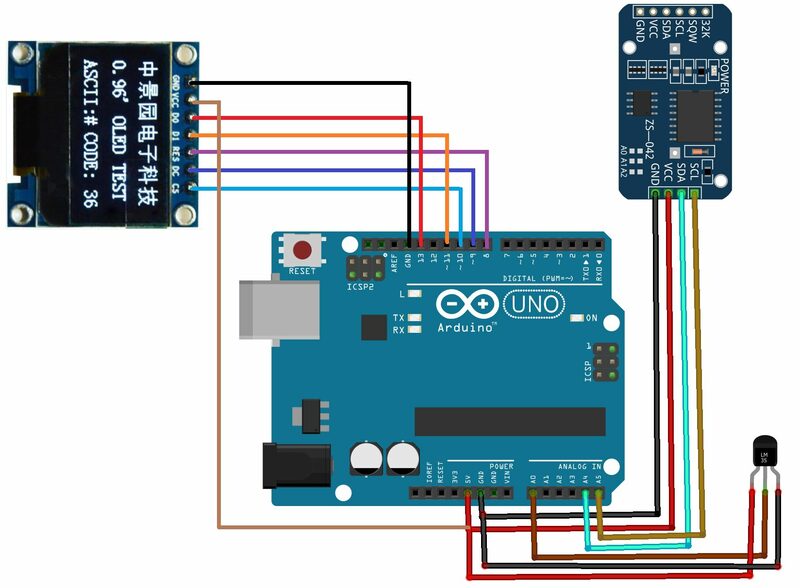 In the end, connect the LM35 sensor with the Arduino. Connect the left pin of LM35 to 5V on the Arduino, the middle pin to A0 on the Arduino and the left pin to ground on the Arduino. First of all, we added the libraries for the DS3231 module and the OLED. The Adafruit library for the OLED has more functions as compared to the other libraries used for OLEDs. Next, we defined the pins where we have connected the DS3231 module and the OLED. The DS3231 module works with the Arduino through the I2C communication so we have used the SDA and SCL pins of the Arduino. The OLED works with the Arduino through SPI communication. Therefore we initialized the pins 8, 9, 10, 11, 13 which are for the SPI communications. After that, we initialized the LM35 sensor pin and other variables. In the setup function, we declared the LM35 sensor pin as input because the Arduino will take the input from the sensor. Then we gave the command to DS3231 and OLED to start communicating with the Arduino. The below lines are commented in the code but if you are using the DS3231 module for the first time and you want to set the day, date, and time, then uncomment these lines and set it. Then we printed the “weather clock” on the OLED for 5 seconds. In the loop function, we read from the LM35 and calculated the temperature. Then we get the time and date and printed on the OLED.